Jonty starts school again today after a two month summer break. He has now had his first day of year 1. It’s funny I’ve been thinking lately how grown up he is getting. But when I just looked at his photos from this morning, I’m grateful to see that he is still little. I’m cherishing this time while they are young. It’s a bit funny being the parent bringing my child into school on the first day. I used to always be the teacher. I kind of miss that first day vibe. Greeting excited children, enthusiastic about the year ahead. Reassuring parents and making a good impression so they will have confidence leaving their precious offspring in your hands. Getting to know the students, learn names, (actually, I don’t miss that, I’m awful at remembering names), determine ability levels and work out how to best cater for the unique individual needs throughout the year. There is always a buzz of excitement as children are keen to display and use their new books and stationary. The clothes and shoes are often new, ready to become marked with stories of their school year. Although not too marked. I remember the awful feeling sending home a little girl who had enthusiastically rubbed black paint onto her paint shirt, but it soaked right through onto her uniform. It never came out. The Mum was not happy. Understandably. I made sure J Boy’s art shirt was plastic backed, just remembering this experience. But today. Today was about being the parent. After weeks of preparing him for school, the day came. He has been nervous about his new teacher. She is known to be strict. Of course, since Jonty is very strong willed, The Accountant and I are delighted with situation, knowing that his teacher will ensure he be respectful of others and learn obedience. Jonty will learn soon enough that she also has a sense of humour and will be sensitive to his needs also. 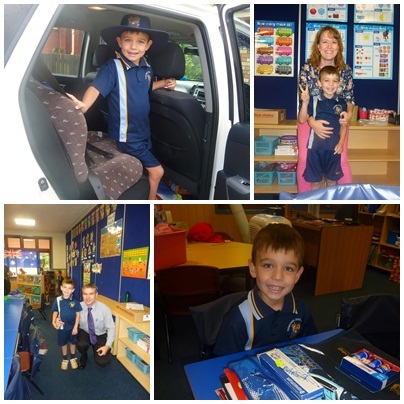 But over the last few weeks he has been nervous about starting school. Thank goodness he has been open and honest enough to share his concerns with me. I hope that he always will be able to feel comfortable to speak to me about what worries him. It has created some lovely moments of teaching where I have advised him of the need to apologise should he do something wrong (he will, I’m sure of it) and to accept responsibility for his behaviour and to recognise when he has done wrong and change the course of his behaviour. We have prayed together and I have seen him face his fears with a quiet confidence. The Accountant and I both took him to school. Miss Rachael came in early and looked after the younger children. These are the type of things that mean a lot to Jonty, and quite frankly, Alex and I rather love sharing these moments with him. He has a brand new classroom. Lucky fellow. Shiny, new and equipped with all the mod cons. He found his desk, and approved of it’s location. He said to me, “I love this spot. This is a great spot!” And so I left him sitting at his desk, ready for a year of learning and growing. I can’t wait to hear the stories of his day when he gets home. My thoughts are also with the thousands of Queensland children who will not start school today because of the floods. We are praying that as the waters peak and recede they will have strength and grace to rebuild and continue your lives. I’m especially thinking of Bundaberg where I lived as a teenager and often visit still. Did a child you love begin school today? What have been your first impressions of the school year for 2013? I Blog On Tuesday with Essentially Jess. What gorgeous photos and memories 🙂 I’ve been the teacher for about 6 first days – this year, with a new bub, was very strange! The most memorable was last year, when I was a teacher at a brand new school, which was also a pilot school for moving Year 7 into high school. Lots of cameras and politicians everywhere! I like how the nervous look in the car photo has turned to a smile at the desk. He’s such a joy! Glad his first day started well! I had 11 excited Year 1’s today in my class- tomorrow my 11 preps come. That will be the real test! I love J Boy’s enthusiasm… I do hope he has a good year. Grade one is loads of fun! How cool that you and Alex got to bring him to school together! Being a parent doesn’t end in sending our kids to school for the first time. As a matter of fact, it never ends. Sending them to school is just one step into creating a path for them to becoming a successful somebody in the future. Teachers, or even tutors, will also have a great influence on them, so it’s best to know these people well also.